the protagonist of this narrative transformed himself from an ordinary person to the undisputed king of Bangla cinema. Yes, we are talking about Razzak, the undisputed king of heroes. Tomorrow, 23 January, is the 75th birthday of this great actor. On this occasion, morning tea pays tribute to the “nayokraj”. Abdur Razzak was born in a conservative Muslim family in British India’s Nagtola, Taligonj, Kolkata. He was the youngest child among the six children (three sons and three daughters) of Akbar Hossain and Nisarunnesa. Razzak lost his parents during his childhood. 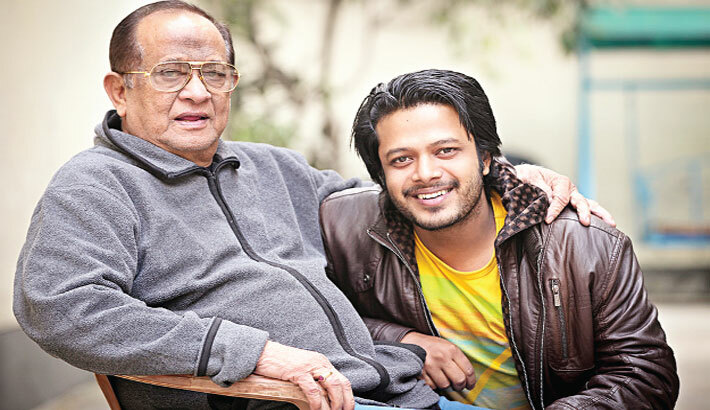 At the age of 22, he moved to Dhaka with a letter written by his mentor Pijush Bosh to Abdul Jabbar Khan. After arriving in Dhaka, Razzak rented a house in Kamalapur. He acted in TV serials and stage plays to prove himself. However, after realising that he was not going to reach his ultimate destination doing TV and stage plays in this way, he met with Abdul Jabbar Khan and started to work as an assistant director in Iqbal Films. Besides that, he also did some short roles in the movies like Dak Babu, Tero No Feku Ostagar Lane and Akheri Station. While Razzak was working with Zahir Raihan, he got the breakthrough he needed. He was selected for the lead role of Behula in 1966 and after that, he never had to look back. Then he worked in Shuvash Dutt’s Kagojer Nouka in 1966 and Amjad Hossain and Nurul Haque’s Agun Nie Khela in 1967. When he was invited by Zahir Raihan to act in Anwara in the same year he was already a superstar. Razzak later acted in Rahim Newaj and Nurul Haque’s Dui Vai in 1967 and Nur Alam Ziko’s Nishi Holo Vor in 1968. With three blockbuster films in the same year- Abirvab by Shuvash Dutt, Atotuku Asha by Narayan Ghosh Mita and Duorani Shuorani by Zahir Raihan, Razzak was propelled to a new height. Maintaining that wonderful choosy attitude, he acted in super hit films like Moner Moto Bou by Rahim Newaj, Moynamoti by Kazi Zahir, Agontuk by Babul Chowdhury and Nil Akasher Niche by Narayan Ghosh Mita. 1970 is one of the most significant years of Razzak’s career as he acted in at least fifteen movies in that year. Amir Hossain’s Je Agune Puri, Narayan Ghosh Mita’s Ka, Kha, Ga, Gha, Ongwa and Dip Neve Nai, Babul Chowdhury’s Aka Baka and Taka Ana Pai, Ahtesham’s Pich Dhala Poth, Nurul Haque Bachhu’s Jog Biyog, Nazrul Islam’s Dorpochurno, Kazi Zahir’s Modhu Milon, Mohoshin’s Dheuer Pore Dheu, Oshok Ghosh’s Nacher Putul and Alamigir Kumkum’s Sritituku Thak are the films, which truly captivated the movie lovers. Besides all these ever-memorable performances, Razzak acted superbly in Abdul Jabbar Khan’s Kach Kata Hira, Nazrul Islam’s Shorolipi and Zahir Raihan’s Jibon Theke Neya. Kach Kata Hira was a film that dealt with social values and human relationships where Razzak played the lead role. Shorolipi was the first film of the country based on a musical story where he paired with Bobita. Jibon Theke Neya is considered as one of the best films ever made in our country. The great political satire inspired the mass people to be aware about their rights and Razzak played the lead male character. During the Liberation War, Razzak went underground, as he couldn’t leave the country. At that time, his children were too young and he also had no relative in Bangladesh. It was not easy for a familiar actor like Razzak to escape the country either. As a result, somehow he tried to survive with his family members in Dhaka. After Bangladesh achieved independence at the cost of three million lives and honour of four hundred thousand women, things were looking very grim for the film industry in Bangladesh. At that critical stage, Razzak started to act in the films again. He worked in the first movie of independent Bangladesh, Ora Egarojon, directed by Chashi Nazrul Islam in 1972. In the same year, he appeared in films like Kamal Ahmed’s Osru Die Lekha, Narayan Ghosh Mita’s Erao Manush, SM Shafi’s Chondo Harie Gelo and Kazi Zahir’s Obujh Mon. Commercial success of these films provided a strong base for the film industry of the newly independent country. Razzak was always under pressure as people expected a lot from him. However, he accepted the challenge and every time came up on the top, breaking all the predictions. Razzak’s angry young man look in his praised movie Rongbaj, directed by Zahirul Haque astonished his fans in 1973. It was the first movie he produced from Rajlokkhi Productions. In the later years, he performed in CB Zaman’s Jhorer Pakhi, Narayan Ghosh Mita’s Alor Michil, Rofiqul Bari Chowdhury’s Bhul Jokhon Vanglo, Ruhul Amin’s Beiman, Azizur Rahman’s Porichoy and Omor Prem, Mostafa Mehmud’s Obak Prithibi, Mohosin’s Badi Theke Begum and Agun, Mustafiz’s Mayar Badhon, Alamgir Kumkum’s Gunda, Dilip Shom’s Alo Tumi Aleya and Najmul Huda Mintu’s Onek Prem Onek Jala. Featuring Bobita in the lead female role, Razzak started directing films with Ononto Prem in 1977. Still many remember this movie as one of the best romantic Bangla films of all time. Then he acted in films like Azharul Islam Khan’s Joker, Azizur Rahman’s Ognishikha, Oshikkhito and Chutir Ghonta, Dilip Biswas’s Anarkoli, Amjad Hossain’s Dui Poyshar Alta, Khoshru Noman’s Raja Shaheb, Kamal Ahmed’s Lalu Vulu, Md Mohiuddin’s Boro Valo Lok Chilo, Jakaria Habib’s Jamana, Satya Shaha’s Ram Rohim Jon and Motin Rahman’s Ondho Bisshash. His acting in Chashi Nazrul Islam’s Chondronath and Bulbul Ahmed’s Rajlokkhi Srikanto satisfied the critics also. Acting is well in Razzak’s blood. During the nineties, when the days of being featured in starring roles were long behind him, he continued acting in supporting roles. He acted only in those films, which have important characters besides hero and heroine. Simultaneously, he produced and directed many praiseworthy films including Mou Chor, Bodnam, Ovijan, Shot Vai, Professor, Mala Moti, Prem Shokti, Uttor Falguni, Chapadangar Bou, Jiner Badsha, Dhaka Chiashi, Baba Kano Chakor, Shontan Jokhon Shotru, Premer Nam Bedona, Mon Diechi Tomake and Ayna Kahini. Razzak was the hero who acted with almost all the heroines of his time and he always maintained a very good understanding with every one of them. His chemistry with Shuchonda in Behula, Shobnom in Nacher Putul, Kobori in Abirvab, Shabana in Obujh Mon, Nuton in Mala Moti and Bobita in Shesh Porjonto proved that Razzak could pull off the best performance with anyone. Directors of that time also preferred him most for the same reason. Back then, all the big film directors had difference in many issues, despite casting Razzak in the lead role. Even the film directors of Kolkata created challenging characters for him. Razzak’s Sharthopor and Onnodata are two films, which left the Kolkata movie lovers spellbound. Till date Razzak have worked in over 300 films. He received national awards for working in Ki Je Kori (1976), Oshikkhito (1978), Boro Valo Lok Chilo (1982), Chondronath (1984) and Jogajog (1988). Nayokraj Razzak achieved lifetime achievement award in National Film Award in 2013. He also obtained country’s highest honour Shadhinota Puroshkar last year. It was not an easy task for a boy to act in the films avoiding the obstacles of the then conservative Muslim society. Razzak rightly faced that challenge and successfully created the path for many other young heroes to walk on. No matter what challenges he faced, he never left his dream. Rumours or gossips never touched him. Whether you count him a hero, husband, father or a human being, Razzak has set a standard for others. His wife Lokkhi always remains as foremost source of inspiration. Among Razzak’s three sons Bapparaj, Bappi, Shomrat and two daughters Shompa and Moyna, his two sons Bapparaj and Shomrat are working in the film arena. He never did anything that can motivate his fans in a negative way. In response, the people of Bangladesh never hesitated to express their love to their most loved hero. When Razzak stepped into the movie scene, he worked with top actors like Anwar Hossain, Azim, Khan Ataur Rahman, Shawkat Akbar, Rahman, Probir Mitra, Uzzal, Bulbul Ahmed, Alamgir, Shohel Rana, Mahmud Koli, Raisul Islam Asad, Wasim and Faruque. All these heroes had all the promises and potentials but it was only Razzak, who became the first superstar of Bangla film. And over the years, keeping his reputation intact, Razzak mesmerized the movie lovers with his versatile performances. As a hero, almost single-handedly he developed the Bangla movie trend. That is the reason why, senior cine journalist Ahmed Zaman Chowdhury gave him the title of “Nayokraj”. Ahead of Razzak’s 75th birthday, morning tea wishes a long, prosperous and peaceful life to the king of our cinema.